Well here we are all packed up and ready to be collected. An early start allowed us the chance to see the kids arriving on shore as we stood for the last time on the top deck. Good fortune followed us again as the sun shone and there was a brilliant blue sky. We caught up with Barbara and Frank to say our fond farewells. We also saw Kevin from NZ as well as Kerry all of whom we wished the best to and made promises to visit each other should we be local. 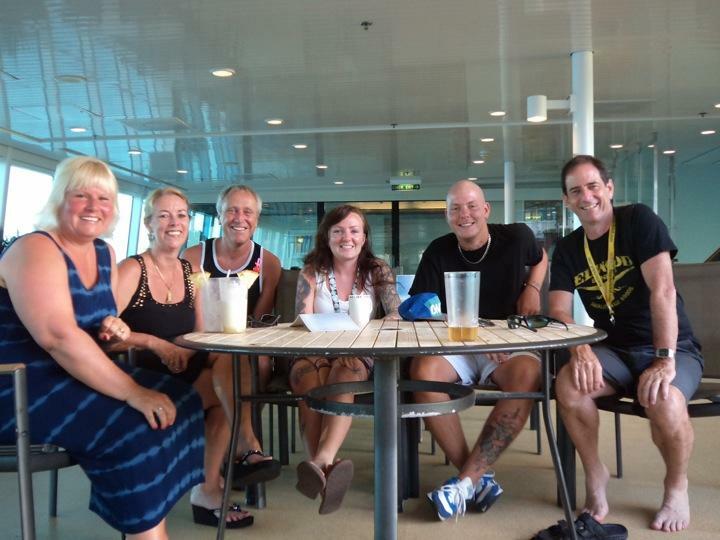 Velda and Michael as well as Dan and Josie are also in our minds as we disembark. No sadness just fond thoughts. Having been back home for a day now you can't believe how much of a drag it is making your own breakfast and lunch. Also there is a load of domestic chores to get stuck into and all with the fear of the dreaded return to work on the horizon. Still it is for these very reasons that if you ever get the opportunity to go on a trip like the one we have been privileged enough to enjoy then take it because 1 you deserve it and 2 you just never know you might not get the chance again. Once again thanks to all of you who have shared this journey with us and I look forward to catching up with you all just as soon as we get the chance.